Churches in America are experiencing an unprecedented fracturing due to their belief and attitude toward the LGBTQ community. Armed with only six passages in the Bible - often known as the "clobber passages" - the traditional Christian position has been one that stands against the full inclusion of our LGBTQ brothers and sisters. 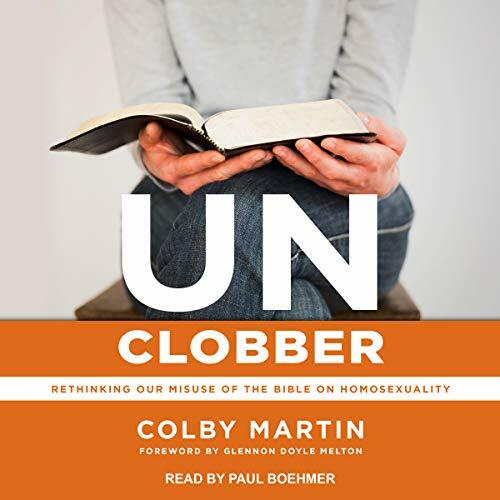 UnClobber reexamines each of those frequently quoted passages of Scripture, alternating with author Colby Martin's own story of being fired from an evangelical megachurch when they discovered his stance on sexuality. UnClobber reexamines what the Bible says (and does not say) about homosexuality in such a way that breathes fresh life into outdated and inaccurate assumptions and interpretations. My faith and belief in a loving God has been strengthened after reading this book. I found your book after watching a video by Jackie Greenland (Jackie G) on YouTube. I know that it was divine timing. I've sat in pews week in and week out, wondering if I have been getting this Faith thing all wrong; Pastor Colby Martin helped me realize, through this book, that I am firmly held in the arms of a God that sees me, loves me, and wants me to know that I am His. I've always said that I'm a 'heart person', and could not understand why as a bi, cis, queer, Christian guy, I am not deserving of God's love, and His promise, because I happen to love people and not their gender or genitalia. My heart just knows to love, as Jesus loves. Pastor Martin, I want to thank you for writing this book and sharing your story. This has been helpful to me spiritually, mentally, and emotionally, as I transition from a non-affirming denomination to one that is open-and-affirming. I learned that my "internal convictions [were] not aligned with [my] external actions." And that, was the missing piece of the puzzle for me. Ironically, like you, it took thirty-two years before I heard those words; I'm so grateful that I did. Your book, I know, has been a healing balm to many LGBTQ+ Christians and their open-and-affirming allies. God has used you as a vessel to help save lives. Thank you. Many continued blessings to you and your family. And Kate, your reward in heaven is great! The book is incredible and so informative while not feeling like a textbook. Colby did an amazing job writing this. Didn’t care too much for the person who read the book, I found his voice to be distracting. I read this in support of my son. I've passed the book on to another friend and recommended it to several people. loved it and finely feel at peace . I've struggled with my faith and my whole hearted need to support my son. Bless you pastor Colby and the work you and your wife are doing!! my mind and heart are aligned!! Colby Martin doesn’t take scripture lightly as he lays out his argument to accept our LGBTQ brothers and sisters. His story is fascinating and relatable and his interpretation of scripture is founded in scripture. This isn’t a gay agenda book, but instead it’s is a book written by a straight man who wants to love his neighbor the best that he can. I appreciate the struggle Colby went through so that he could learn and now share so that the Kingdom of God can continue to grow. I paired the narration with the book, which really helped my experience. The audio is clear, but I like the visual representation of the words to help me focus and better understand the content.